If you're on the lookout for a casual yet chic ensemble, choose a Lemaire stretch fit t shirt and a beige print midi dress. Both pieces are totally comfy and will look fabulous paired together. For something more on the daring side to finish off this look, go for a pair of silver leather ballerina shoes. If you're looking for a casual yet absolutely chic ensemble, marry a Lemaire stretch fit t shirt from farfetch.com with charcoal flare jeans. Both garments are totally comfy and will look fabulous together. 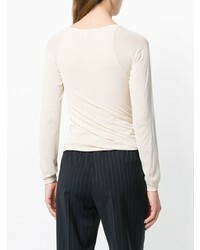 If you're in search of a casual yet chic getup, wear a Lemaire stretch fit t shirt with black leather skinny pants. Both pieces are totally comfy and will look fabulous together. For something more on the daring side to complete this outfit, rock a pair of black leather ballerina shoes. If you're looking for a casual yet stylish outfit, go for a beige long sleeve t-shirt and a grey fair isle sweater dress. Both pieces are totally comfy and will look fabulous together. 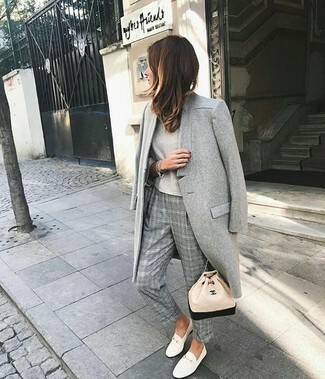 If you're on the hunt for a casual yet chic look, marry a beige long sleeve t-shirt with grey plaid dress pants. Both garments are totally comfy and will look fabulous together. White leather low top sneakers will deliver a casual vibe to your outfit. If you're scouting for a casual yet chic getup, pair a Lemaire stretch fit t shirt with white skinny jeans. Both garments are totally comfy and will look fabulous together. Make beige suede pumps your footwear choice to instantly up the chic factor of any outfit. If you're in search of a casual yet totally chic look, pair a Lemaire stretch fit t shirt with a pink pleated midi skirt. Both items are totally comfy and will look fabulous paired together. Bring instant glamour to your outfit with burgundy leather ankle boots. If you're on the lookout for a casual yet totally stylish outfit, opt for a Lemaire stretch fit t shirt and a black leather mini skirt. Both items are totally comfy and will look fabulous together. Got bored with this ensemble? Enter black suede over the knee boots to shake things up. If you're searching for a casual yet totally chic ensemble, reach for a beige long sleeve t-shirt and white ripped skinny jeans. Both pieces are totally comfy and will look fabulous together. Sporting a pair of tan leather pumps is an easy way to add some flair to your getup.